Vacation Concierge proudly represents... Harbor Cove! Vacation, short-term, or corporate housing rental available at Dana Point’s best kept little secret - Harbor Cove! Tucked just off the main road into the heart of Dana Point Harbor, Harbor Cove is only ¼ mile (15 min.) walk to world renowned Doheny Beach Park and Dana Point Harbor and a short 15 min drive to beautiful Laguna Beach. 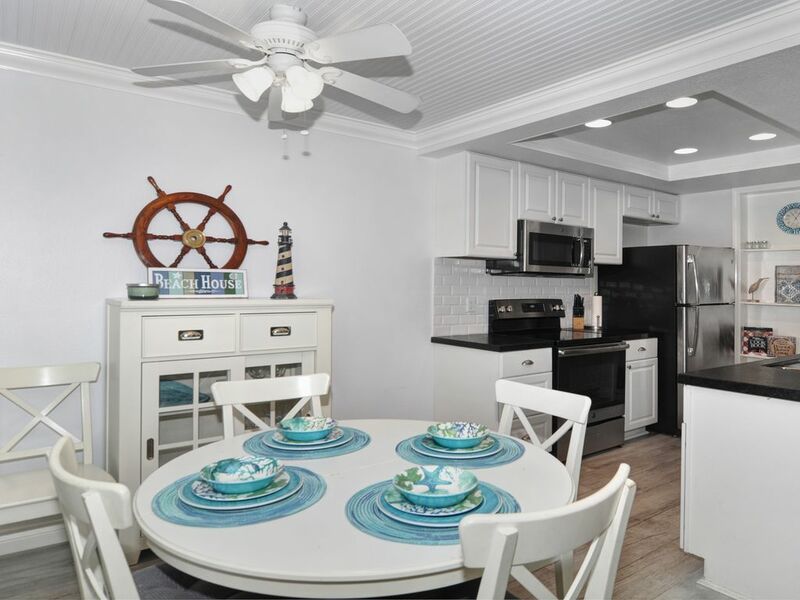 Harbor Cove is a nautical themed, 2 bed / 2 bath condo that sleeps 7. It's a lower level unit - no stairs - in a completely flat complex. There's even a dog walk within the complex! Harbor Cove offers a quiet pool and a large spa at the center of the complex with the relaxing sounds of small creeks, streams, and footbridges throughout the development. Our renovated condominium home is a comfortable 900 s.f. and is just steps away from the community pool and spa. Vacation Concierge, Inc. proudly represents this vacation rental Vacation Concierge is a hospitality and concierge services company providing quality service and care during your stay. You will be greeted with a lovely welcome gift basket, an informative guest guide book and all the amenities afforded a boutique hotel experience. We are here for you 24 / 7 during your stay. We look forward to having you as our guests! Our stay at Harbour Cove was utterly delightful! The 2 bedroom 2 bath condo was wonderfully and elegantly decorated, sparkling clean and the location- superb! The Harbour within walking distance - every convenience within easy distance! It served our every need! The pool was lovely, and the babbling brook outside our door made us think we were in the great outdoors day and night! This was my favourite place in all my stays in California! We do hope to come again! We so enjoyed having you as our guests and are pleased you enjoyed being so close to the harbor and all that Dana Point has to offer. We look forward to your next visit! Katherine W.Where do you live? The only reason I rate this condo low is, after leaving the place spotless, it takes a full month (plus) to receive your refund - I checked out on 4/17 & as of 5/22 still don't have the check (I hear it is OTW). Most places have a minimum 2 week turn around, so this is a downside to me. However, the condo is very nice. It is smaller than the photos lead you to believe, but was comfortable and clean. The dishwasher needed to be repaired/replaced as dishes going into it came out even dirtier than they had been, and, as some of the dishes in the cupboards were put away dirty, you knew it wasn't a "new" issue. Did make management aware, so hopefully that has been fixed. The location is lovely - you are a few feet from the pool - which is too cold for me, but probably not kids and the hot tub was lovely. Because you are close by, you do hear noise from the pool area, but it is closed by 10pm and I never thought it was an issue. The beach is almost a mile away - it's a nice walk, but not right outside your door. I enjoyed getting to run there and back, but I wouldn't want to haul my surf board that far - it is a one minute drive if you are carrying a bunch of items. Furniture was comfy, master bed room was roomy and pleasant. I would keep a max of 4 people here, but you could bunk someone on the couch if you don't mind being cozy. They allowed my small dog to stay, which was a huge perk, and we were very comfy with one or two guests periodically, It is a nice, quiet, community (at least while I was there) & the parking was enough that I was able to park my large truck (a dully would be tough). My biggest complaint? All the speed bumps! After a month of driving over them every day, I was done with that - otherwise, and with a faster return on the check, I would rate this a high 4 stars and stay here again. Thank you for your kind review. We enjoyed having you as our guests. As per the signed rental agreement the deposit is fully refundable within 30 days (see first page). That is to allow a full billing cycle to occur in case there are excessive utility use above and beyond what is estimated for typical use. Your deposit was returned at the 30 day mark via a company check. It should arrive any day. I hope that you would reconsider changing the rating as this return of the deposit check was a condition to which you agreed to before you stayed with us. Upon receiving Ed’s review this morning we immediately called him and apologized that he had this type of an experience with us. While all of these items he noted were addressed and remedied during his stay we take responsibility for our service team and cleaning service both whom could have been more timely in their response and more thorough in taking care of our guests needs. Vacation Concierge appreciates Ed’s feedback and while this is our first negative review we’ve received on any of our many properties we represent there is always room to improve and provide better service going forward. We stayed at Harbor Cover for 3 weeks during our transition between home purchases. It was a great location with a nice pool and close location to all the great things in Dana Point. We really enjoyed our time there. The bet part of the experience was the great work on behalf of the property management team. We had to extend our stay and they were very accommodating. We also had one minor fix that needed to be made in the kitchen and they were on it in less than a few hours! Amazing! Our stay was extremely comfortable and convenient. Loved the early morning walks to the beach. Convenient to family and friends. We had a plumbing issue, which was solved quickly. Would definitely recommend to others. Thank you Jeffrey and Jenna for the use of your condo. The condo at Harbor Cove is sunny & well kept. Having the pool & hot tub outside your door is very convenient to the condo. A half hour walk along the river takes you to the beach & harbor without crossing any streets. The beach has beautiful sand and bikes can be rented there. In the harbor is a busy coffee shop & many very good moderately priced restaurants. At the Dana Point area is the Marine Science Center. The children would like the tidal pool or you could sit & watch the sunset. A very nice experience.